Because you only go to bars that share a name with Big-10-quarterbacks-turned-FBI-agents-who-break-up-bank-robbing-rings-orchestrated-by-bleach-blond-buddhists, head to Johnny Utah's: the first Philly outpost of the New York urban cowboy retreat, now open and decked with antler chandeliers, exposed barn beams, a mechanical bull, and (yawn) girls in too-tight tank tops & Daisy Dukes who'll serve you all kinds of country awesome, including..
Booze: Expect not-liquors like Mason jar goblets of wine and domestic draft beer towers, half-liquors like the Tequila Makes Her Clothes Fall Off (1800 silver shot and a Coors Light draft) and Upside Down Rodeo Clown (1800 marg w/ an upside-down Coronita in it), and liquory-liquors like boozy lemonades and adult teas including the Tennessee Honey (schnapps & honey whiskey) and the Kentucky, which mixes Maker's with sweet tea... vodka (! ), also what Mariska Hargitay says to her homie Ice whenever he's all "Yo Mariska, I'm gonna pick up some hard-a at the liquor store, what you want? 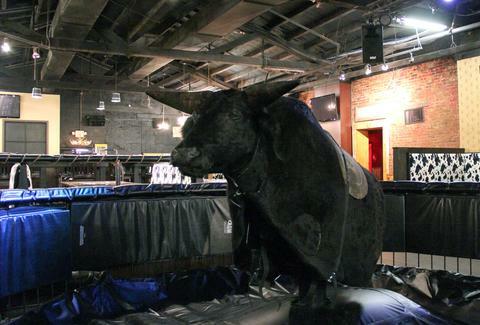 Badass-ery: To keep the week interesting, JU's is offering up discount-ery like a Wednesday-only $14 pitcher & wing combo served on a souvenir Frisbee platter, bikini bull-riding contests on Thursdays, and Daisy Duke Fridays where you'll judge hotties in cut-off jean shorts, assuming you're willing to take a Point Break from bull-riding.